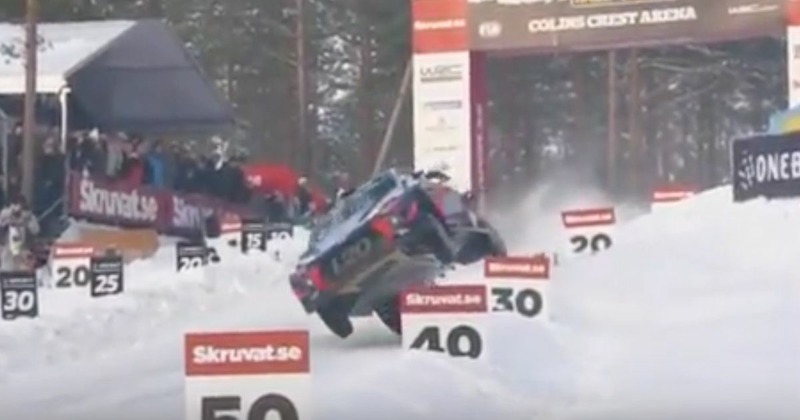 Thierry Neuville may be leading at the end of day two of Rally Sweden, but not without this massive moment on stage 14. The stage features a jump called ‘Colin’s Crest’ in memory of the late, great Colin McRae. It’s a popular area for spectators as the fast, blind entry leads to spectacular airtime and an award for the driver who jumps the furthest. Neuville didn’t trouble the record of 45 meters but that didn’t make his effort any less dramatic. He got the entry slightly wrong, clipped the distance markers and looked for all the world like he was heading straight to the scene of a sizeable accident. Instead, he somehow landed on two wheels before carrying on as if nothing had happened. Incredibly he went on to win the stage, too. Rally drivers really are a different breed!